It can be fun to purchase older trading card products looking for a hot rookie from a particular year or trying to put together a set. It can also be frustrating if you open that product and find an autograph redemption card that has expired and is no longer valid. 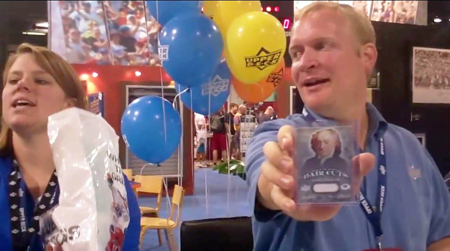 Some Upper Deck products include autograph redemption cards that expire. Upper Deck publishes on boxes and packs, “Packs may contain time sensitive Redemption cards. Be certain to adhere to the expiration dates in order to redeem your card. No redemption will be honored past the expiration date.” Although customers and dealers are aware of these limitations, Upper Deck provides a limited opportunity for collectors to participate in a raffle for autograph cards and various other prizes (the “Raffle”) at the Sport Card & Memorabilia Expo in May, the National Sports Collectors Convention in the summer, and the Sport Card & Memorabilia Expo in November (each a “Convention” or collectively the “Conventions”). When customers pull an autograph redemption card that has expired, Upper Deck has offered an alternative. 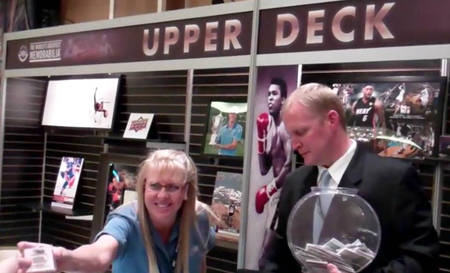 At the 2012 National Sports Collectors Convention we ran the company’s first Expired Redemption Raffle and the response from the collectors who participated was overwhelmingly positive. Collectors and dealers were allowed to submit up to five (5) expired autograph redemption cards that contained an unscratched code on them and were eligible to receive one of 100 autograph/memorabilia insert cards. The program was run successfully for almost four years. 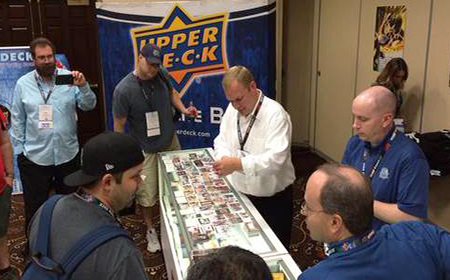 Having received feedback from dealers and fans throughout the process, Upper Deck is pleased to announce some enhancements to the program. These changes are designed to improve the overall customer experience with these expired redemption claims through the Raffle program. Resist the temptation to scratch off the area on the card below the item description. You will not be able to redeem the redemption card online. We will only accept cards that are unscratched at the Conventions. We will now accept redemption cards that have been scratched through mail-in submissions, BUT WE CONFIRM INTERNALLY THEY HAVE NOT ALREADY BEEN REDEEMED. If the redemption cards received by Upper Deck have already been redeemed, they will be returned to the customer in the condition received and not eligible for the raffle. Up to five expired redemption cards can be submitted here: The Upper Deck Company, Attn: Expired Redemption Raffle, 5830 El Camino Real, Carlsbad, California 92008. Please note, Upper Deck is not responsible for lost or stolen redemptions. Expired redemption cards mailed to Upper Deck can be scratched or unscratched; as long as they have not been redeemed they will be eligible to participate in the Raffle. Should the window be closed on a particular Raffle, such submitted expired redemptions will be entered in the Raffle at the next Convention. Customers must write their valid name, address, phone number and email address on the expired autograph redemption card(s) they are submitting. Raffles will be run at the Convention where winners can pick up their winning items immediately afterwards. Those not in attendance will have their prize(s) sent to them. Raffles will now be conducted in three tiers based on the redemption card current Beckett values and cards not listed in Beckett will be valued solely by Upper Deck staff based on current market conditions. Redemption cards valued at $0-$99 will go into the General Expired Redemption Raffle for redemption cards with similar values, as determined by Upper Deck in its sole discretion. Redemption cards valued at $100-$249 will go into the Premium Expired Redemption Raffle for redemption cards with similar values, as determined by Upper Deck in its sole discretion. Redemption cards valued at $250+ will go into the Super Premium Expired Redemption Raffle for redemption cards with similar values, as determined by Upper Deck in its sole discretion. The Raffle is NOT sport specific. By submitting an expired redemption, you understand you may receive product from a different sport or from subjects outside the world of sports; all products are selected by Upper Deck in its sole discretion, and may not be substituted. It is important to note these redemption cards are only good for autograph redemption cards produced by Upper Deck with scratch off codes. Expired Draft Pick redemptions, expired sweepstakes offers and autograph redemption offers produced before scratch off codes were applied are no longer valid and cannot be submitted for this program. Entries that are not addressed correctly, that are not qualified expired Upper Deck redemptions or that do not have customer information added to the card will be returned to the collector in the condition received and will not be submitted as part of the Raffle. The number of products in the Raffle will be determined by Upper Deck on a case by case basis and in its sole discretion. 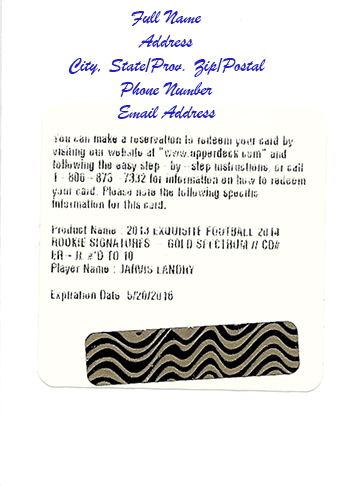 Upper Deck makes no representation’s or warranties as to the value of each product awarded in the Raffle. Upper Deck, in its sole discretion, reserves the right to alter, modify, or cancel this promotion at any time and for any reason. In the event of a cancellation, Upper Deck will return any redemption cards mailed to Upper Deck’s office. Please contact Upper Deck’s Customer Care team with any questions.